Tenerife, one of the Canary Islands, is no longer a getaway exclusively for Europeans. Located 65 miles off the west coast of Africa, Tenerife is a welcome change for those who have "done" the Caribbean and want the flavor of Europe and Africa in an island setting. Tenerife, the most accessible of Spain's Canary Islands, is truly a continent in miniature with something for everyone, ranging from snow-capped Mt. 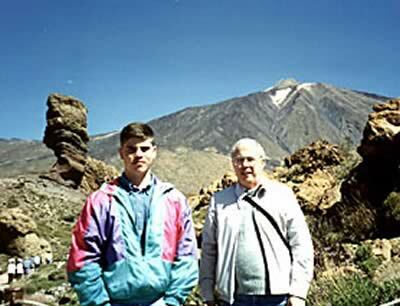 Teide, to sun-soaked beaches, to lava-covered lunar landscapes, to pine forests. The verdant north coast is dotted with unspoiled island villages, while the south is chock-a-block full of hotels. In Playa de las Americas, you can go deep-sea diving in the morning, on a camel ride in the afternoon, and have dinner in a medieval castle before ending the evening in a casino. Of course, if lazing in the sun, alternating between dozing and reading a favorite book is your idea of a vacation, then Tenerife - with miles of beaches and many resort hotels - is the perfect destination. With spring-like weather the year round, golf and tennis are always an option for the sport enthusiast. A day trip to Spain's highest peak, Pico de Teide (rhymes with lady), is a do-not-miss. From sea level to the summit, which is often snow covered, there are many climate zones. Starting in the tropics at the lowest elevation, the road traverses a pine forest before reaching the moon-like, desert landscape near the top. A cable car takes passengers to the top of the 12,200-foot mountain for a panoramic view of the island. Tours usually include lunch at a restaurant featuring food typical of the Canary Islands. 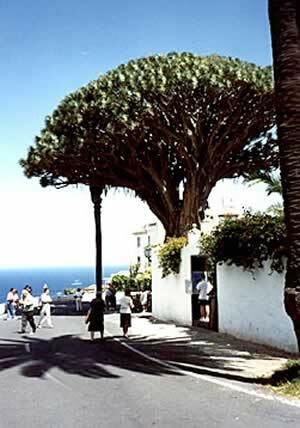 The picturesque village of Icod de las Vinos, 20 miles north of Playa de las Americas in the middle of a very fertile valley, offers an impressive view of Teide, and it is here that the thousand-year-old dragon tree is found. The trees were worshipped by the natives as a symbol of fertility and knowledge. The city of Puerto de la Cruz, 15 miles east of lcod de las Vinos, was the first resort area to be developed on Tenerife. Lago Martinez, in the heart of downtown, is a man-made swimming pool the size of a small lake complete with islands, bridges, and fountains. Just outside of town on the main road heading east, the cool and serene botanical garden is filled with unique tropical plants and trees. Santa Cruz, the provincial capital, is a bustling city of skyscrapers and 200,000 people. Of interest is the museum of archeology and anthropology with its display of mummies, and the Plaza de Espana, which is dominated by a towering statue honoring those who died in the Spanish Civil War. Five miles northeast of the city, a mile-long golden sand beach, Playa de las Teresitas, was created from sand brought in from the Sahara. Tenerife has a variety of activities designed to keep even the most jaded tourist happy. Day safaris by camel, jeep, or donkey are offered by many tour companies as well as a compete gamut of water activities from sailing to diving. The Yellow Submarine is perfect for those who want to see the underwater life without getting wet. In Playa del Las America, numerous restaurants and cafes, many with cabaret-style entertainment, line the beach promenades and Avenida Litoran. The food is excellent and reasonable. Most restaurants offer paella, the local specialty of rice and seafood. The Canary Islands are surrounded by some of the world's richest fishing grounds. Castillo Medieval in San Miguel combines a traditional King Arthur-style banquet with medieval entertainment. Most hotels and pubs offer free entertainment that can range from karaoke, to Flamenco dancing, to fashion shows. Shoppers will love Tenerife, a free port with no value-added tax on luxury goods. The island is famed for its pottery, a craft inherited from the original inhabitants of the islands, the Guarches. In the Canary Archipelago, there are seven major islands. Each one has its own unique characteristic and can be reached easily by boat or plane from Tenerife. Whatever your dream vacation plans include, if it can not be done on Tenerife or one of the adjacent islands, it probably can't be done anywhere. Ptolemy, the ancient Egyptian ruler, was indeed correct when he called the Canary Islands the "Fortunate Islands" because of their perpetually mild, spring-like weather, temperate waters, and beautiful vistas.